loves on you, you know it! Every birthday, since we've met, she has come with a freshly baked goody (cakes, giant Winnie the Pooh Cookies, and more) in addition to hand made cards and tons of love!! 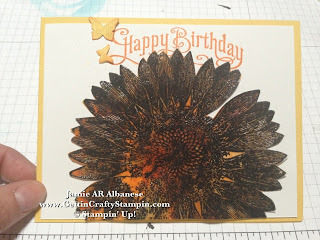 With the use of Vellum Card Stock (Idea Book & Catalog) and embossing this Sunflower background stamp in Black - it's the base for a Stained Glass card! Spritz lightly with water, use the Re-Inkers in Daffodil Delight and Pumpkin Pie (her two favorite colors!). The New Stampin' Spritzer (Idea Book & Catalog) can be filled with any color but is ideal, too, when just filled with water. A fine mist is perfect for this technique. Aqua Painters pull the re-inker ink through and give a great layered technique. ALWAYS start with the lighter color and build the darker on top of this. 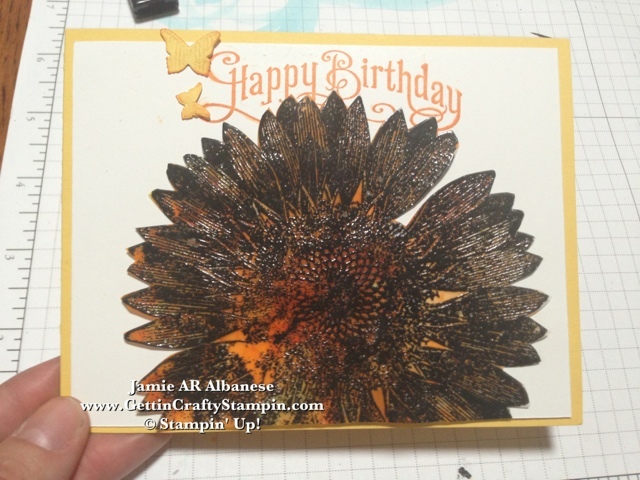 Cutting the Sunflower is easy with our Paper Snips! 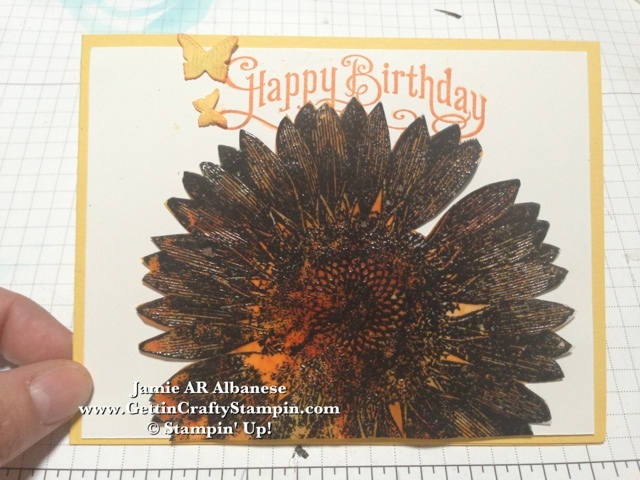 The precision edges and pointed tip make it easy and even fun to cut projects out! 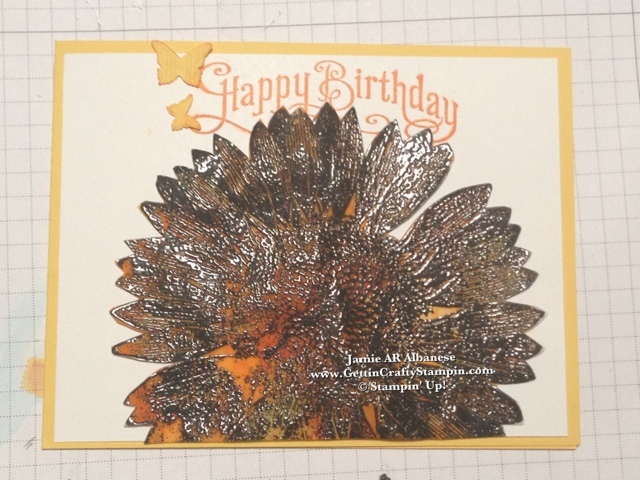 Perfectly Penned Happy Birthday greeting stamped on Whisper White card stock with Pumpkin Pie ink. Mini Glue dots adhere this flower down, the white card stock reflects the light through the embossed spaces - resulting in a Stained Glass look and the edges of this cut out flower curl ever so slightly and look (almost) life like! Stained Glass Butterfly (click HERE to see it in detail) and this is a similar take to the card. 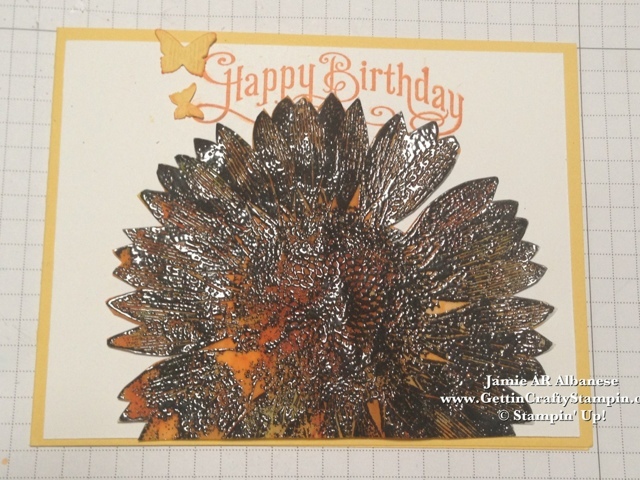 My dear, dear friend DID like this card! We had fun playing with this technique on her birthday today! Her favorite colors while also embracing her love of flowers! Celebrate those you love on their special days!! 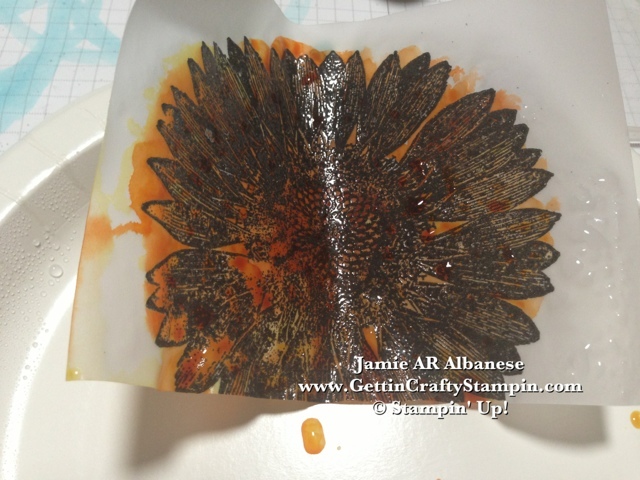 Do YOU love and play with our embossing powders and new heat guns?!?! From Elegant Metals, Bold Colors, Iridescent Ice sparkle, Scented powders... it's limitless what YOU can do with our Embossing Powders, tools and fun! 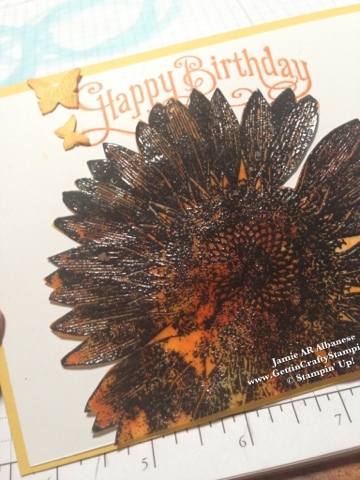 This is a bold and beautiful flower card for your special friend. Thanks for sharing your talent with the LNS group this week.